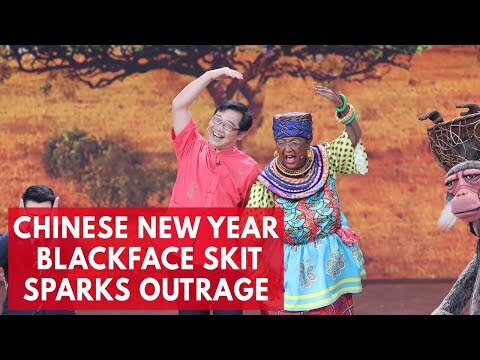 I learned very little from this skit in CCTV’s 2018 New Year’s program. I’d known that Chinese construction contractors had been working on a railroad in Kenya, but didn’t know that it extended all the way to the coastline. Other than that, nothing was new. There was the Jimmy Fallon replica, innocent ambassador for Chinese goodwill, caught in a romantic entanglement with an African woman hoping to study at a Chinese university. Enthralled audiences looked on at extravagant dance numbers, infected by the wryly vaudevillian, subtly gestured humor unique to Chinese talk shows. Finally, there was the curiosity, the curiosity of a nation growing into its power as a nascent colonizer, a curiosity smeared all over the face of actress Lou Naiming as she stepped from behind the curtain. Her character is all the Chinese imagination can hold. Aggressively matriarchal, complete with fake buttocks. Body paint and gaudy pleats covering her like a piñata dreamed up by Rudyard Kipling. Her choreography and voice lifted straight from Song of the South, an Aunt Jemimah de-Romanized for the Chinese eye. While the other characters in the skit tip toe around jokes hinting at interracial relationships and pantomime surprise at an African girl’s Chinese language abilities, Lou’s character is what fixates onlookers with her kitschy, explicit caricature. Hearing her daughter’s aspirations to study abroad, Lou explodes with patriotic sincerity, crying out her love for China and its people to uproarious approval. In my mind, the ignorance around race representation in China is no different from ignorance anywhere else. That Chinese people have a reputation for obtuseness and insensitivity does not result from any innate tendency toward hatefulness, but from the headlines produced by American news companies writing on “Chinese racism”, and the glee with which their primarily white audiences consume them. I imagine that the way white people feel when reading about racism in China is how I feel when I hear my white classmates practice their Chinese. Race and blackness are seen as so profoundly American, and China as so profoundly un-American, that juxtaposing the two has produced fertile opportunities for exploitation and entertainment. For the white audience, race issues in Asia are spectacles, produced by a culture that still doesn’t get it. To the Asian-American liberal, on the other hand, the extravagant racism on display in China is horrifying. Today, our movement has become more and more receptive toward broadening what counts as “Asian-American” and developing alliances with other racial groups. The FBI’s decision to label Asian international students as spies was met with sharp retorts from Asian-Americans across the country, and an anti-affirmative action lawsuit targeting Harvard University is being met with sensitive testimonies on race in college admissions. Asian-American voters skewed heavily Democratic in 2016; young Asian-Americans fervently support Black Lives Matter. These efforts serve to distinguish us from, for example, our parents’ more conservative ideologies brought over from home, the kind displayed in programs like the gala. When a harsh spotlight is thrown upon the problems festering across the ocean, our natural inclination is to cringe and move away. It is naturally tempting to dismiss the attention paid to the gala as solely an effort to emphasize Asian foreignness and declare that Asian-Americans and Asians must be viewed differently. In doing so we could free ourselves from culpability. No one can deny that it was wrong to jail Japanese Americans for Japan’s attacks on America; how can Asian-Americans be held responsible for Asian racism? I had the chance to go see the Higher Brothers, a popular Chinese hip-hop group, live one night. The line into the venue stretched around the block, filled with fans dressed in graphic hoodies, expensive sneakers, and an occasional head full of dreadlocks. We were all excited: it’s not often that we get to see ourselves on stage, especially not in any rebellious or boisterous context. Cigarettes flared, music was blasting, people passed around burger boxes to strangers. Across the street, three police vans came around the block and raced into an alley, pursuing an unseen suspect. Sirens louder than our speakers. For a moment, as the blue lights flashed across faces reflective with pale make-up, people froze. For an instant, we were self-conscious, college partiers caught out past dark waving our parents’ money around. Then the houses ate the sirens away, someone laughed, and the conversations resumed. Context is everything. 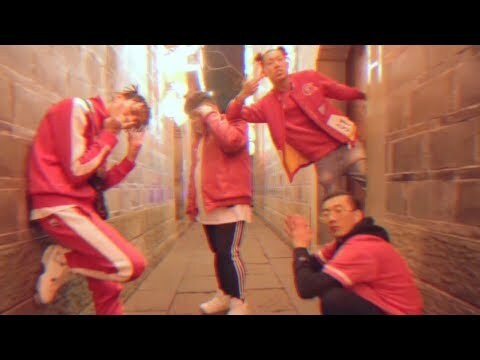 The Higher Brothers are captivating because they are undeniably Chinese, Chengdu dialects tossed out with bravado, bamboo all over the walls of their music videos. They are not trying to replicate an American look, refreshing for Asian-Americans encouraged to assimilate into white culture. But their decision to become so-called rap stars and their embrace of trap beats and rhythms are directly lifted from a black aesthetic. I could not stand on the street watching police vans drive by without being reminded of how heavily policed typical rap shows are, in stark contrast to the show I was attending. We were there, some hundreds, and nobody questioned us. I enjoyed the show. The Higher Brothers are talented, I had a blast screaming along to live Chinese lyrics for the first time in my life. I’m sure they’re going to be even more successful in the future. Even fake chains get the chance to glow under the spotlight. 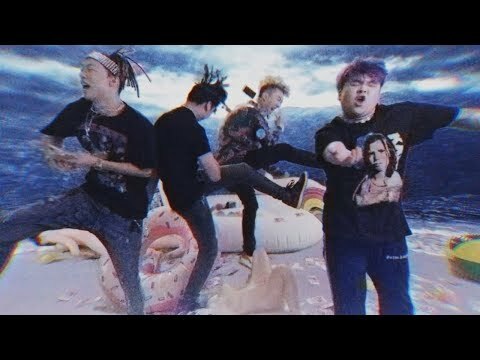 I talk about the Higher Brothers because they represent the kind of phenomenon that resonates personally with Asian-Americans. Straddling the line between East and West, they are able to communicate comfort with their identities as Asian men, reject social norms, and shut down any racially charged criticisms thrown at them. They don’t belong anywhere. Chengdu, with its fireball culinary history, sharp-tongued dialect, environmental protections, and burgeoning trap music scene, is a modern response to traditional China. For Asian-Americans, who find themselves fitting into neither America’s white fences nor the regulation apartment blocks of Asia, the Higher Brothers offer a third spatial alternative. Authentically Asian, with a twist. The trick the Higher Brothers have pulled, and the reason they are so appealing, is that they are safe. For all their bluster, their lyrics tend to espouse hard work, celebrate Chinese cultural products, and praise designer clothing. Look beneath the Kendrick Lamar references and gold chains, and the Higher Brothers reveal themselves as fairly innocuous. They cannot really be hard if their primary audience is wealthy, college-prep teenagers, and they cannot really be subversive if the Chinese government gave them a pass on its hip-hop ban. Great flow, sweet lyrics, not much content. This last description rings true for many rappers in the US today. Commercialism and frivolous lyrics could describe half the contemporary hip-hop scene in America. The qualities distinguishing the Higher Brothers from their American counterparts are their race, their language, and their police records. Black hip hop artists and their audiences, caught in the net of racial policing, have been charged, fined, and jailed, for criminal catchphrases ranging from inciting riots to weed possession at shows. For all the smoking going on at the Higher Brothers show, no police showed up, no security guards crept through the crowd, and no one ended up in handcuffs. The Higher Brothers’ decision to enter the rap scene was entirely their own. I am not in the position to say that they should have chosen a different medium for their artistry. Even if I were, I don’t want to. I do not believe that the Higher Brothers are doing harm to anybody with their decision. The little exploitation that is present in their music might be Masiwei’s poorly done dreadlocks. I question them solely because their decision to use a black aesthetic and resultant explosive rise to popularity in two different countries, raises concerns about how Asian-Americans cope in a society that pits them against black Americans in a cultural and political rat race. I am doubtful about the extent to which Asian-Americans can truly claim to be separate from Asians. Our already fragile conception of anything like Asian power will not last long if we do not acknowledge the racial baggage brought over from the far shore. The relationship, both real and imagined, between the Asian and African American communities is a storied one, documented in film and music dating back decades. Gunshots and fists in Do the Right Thing, Menace II Society, Rush Hour, Crash, and most recently, Gook. The Fugees, Ice Cube, and Wu Tang Clan all playing up the combat in their albums, while Dan the Automator and Kid Koala were banding with Del the Funky Homosapien to beat up the white corporate music bosses as Deltron 3030. Lately, some Indonesian kid calling himself a chigga and getting picked up by Ghostface Killah for a remix. Last year, we also had Jordan Peele’s Get Out, a film already destined for attention as the first ever racial horror film, made doubly interesting to the Asian-American community for depicting a Japanese man participating in a modern slave auction. Hiroki Tanaka, as he is named in the credits, appears for less than five minutes, but that time is more than enough to leave an impression. Distinguished in a black suit and cocktail in hand, unquestionably foreign with his thick accent and clumsy questioning about race in America, Tanaka joins other bidders trying to purchase the opportunity to live in a black man’s body. There are details to nit-pick about Peele’s Japanese man. He is posh, asexual, exotic, insensitively wealthy, all well used stereotypes for East Asian men. These tropes, however cliché, do not represent real inaccuracies within the context of the film. The true mistake Peele makes is in assuming that it would be an Asian foreigner trying to purchase a black body, and not an Asian-American. Get Out is, ostensibly, a film about white people, and specifically white liberals, fetishizing black art and black bodies while failing to acknowledge black people’s humanity. Americans know, whether they say it or not, that black has always been synonymous with cool. Asian-Americans, in our fight for visibility and relevance, are aware that being cool, whatever that may mean, is the gateway to social acceptance. At the same time, the stifling of Asian creativity in America has forced Asian-Americans into alternative expression. Some trap themselves with assimilationist thought, perpetually aware that what is yellow can never become white. Others pick up chains, blast hip-hop, and call themselves chiggas. Asian-Americans’ motivations for trying on blackness are different than white people’s motivations, but the visible product is the same. Hiroki Tanaka lives inside us all. Whenever I talk to Asian international students, our conversations often drift, driven by their curiosity about a new country, to race. In my experience, at least, Asians tend to be far more open about admitting ignorance and stating their beliefs than Asian-Americans. I suspect that this is because they have never felt racially threatened for their beliefs about identity. More broadly speaking, Asians living in an Asian-dominant culture do not experience the racial insecurities that Asian-Americans do. It has never occurred to my parents or my international friends to consider their Asian-ness as something detrimental to their happiness, whereas this is a thought that constantly plagues my mind. If Hiroki wanted to be happy in immortality, he would have looked for a Japanese body. The Higher Brothers do not want to be black; their aesthetic decisions come from shrewd observations on what does and does not sell in the market. But their music, broadcasted to an American context, may be a route to blackness by proxy. I wonder what part of my attraction to their music comes from a genuine need for Asian media, and what part comes from a desire to try on blackness as an escape from the stereotypes ascribed to me as an Asian in America. The line for the show had stretched across two blocks, so many people wanting in on the counterculture. What I am trying to say has a little to do with appropriation, and a lot to do with how Asian-Americans need to change their thinking around racial politics. It is nice to imagine banding together with others against white supremacy, but this is a flimsy dream based on trust that doesn’t exist. Whatever the polls may say about Asian-American support for Black Lives Matter, a survey question is nothing more than a survey question. Our ally-ship is dubious as long as we continue using blackness as a crutch for expression, and practically meaningless when we shroud that crutch under the “cultural appreciation” lie. I cannot forget that it’s not just Hiroki Tanaka alive inside me; pieces of Peter Liang and Soon Ja Du are there, too. It would be more productive for us to combat the self-hatred motivating our appropriations and poisoning our community. For that, we will need to take advantage of our peers across the sea. The two Asian shores are growing undeniably closer, exchanges happening across universities, concert stages, and social media. While others remain blind to our diversity, we must capitalize on our disparate strengths. While others refuse to communicate with us and insult our brilliant languages, we must communicate with each other on a more intimate level. We have, indeed, much to learn from each other. For Asian-Americans, Asians can model what it means to be comfortable and creative within our skins, without needing to fall back onto a black-white American cultural spectrum for support. And for Asians, Asian-Americans can model the code switching and amphibious cultural expertise that have permitted us to thrive in diverse institutional settings and adjust to trends in political sensitivity. Our insecurities are ours, and ours only, to solve. Once we accept that responsibility, we will be able to access expressions and innovations previously unimaginable. No more submission to whiteness, no more teetering on faux blackness. We’ll have our own sanctuaries. If all goes well, we might even agree, finally, that dreads look horrible on us. This article was originally published in Plan A Magazine, an examination of Asian-American online culture. Will We Ever See a Chinese Superhero Movie?